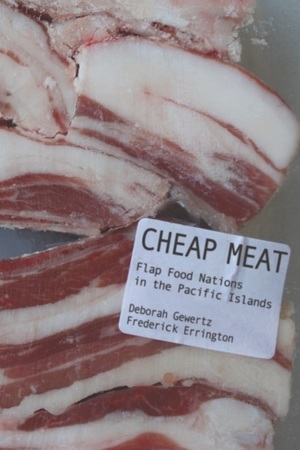 Cheap Meat follows the controversial trade in inexpensive fatty cuts of lamb or mutton, called “flaps,” from the farms of New Zealand and Australia to their primary markets in the Pacific islands of Papua New Guinea, Tonga, and Fiji. Deborah Gewertz and Frederick Errington address the evolution of the meat trade itself along with the changing practices of exchange in Papua New Guinea. They show that flaps—which are taken from the animals’ bellies and are often 50 percent fat—are not mere market transactions but evidence of the social nature of nutrition policies, illustrating and reinforcing Pacific Islanders’ presumed second-class status relative to the white populations of Australia and New Zealand. Deborah Gewertz is G. Henry Whitcomb 1874 Professor of Anthropology and Chair of the Department of Anthropology and Sociology at Amherst College. Frederick Errington is Distinguished Professor of Anthropology at Trinity College, Hartford, Connecticut. Among their many books are Emerging Class in Papua New Guinea: The Telling of Difference and Yali's Question: Sugar, Culture, and History.